I’m slowly discovering a new perennial. They first found their way into my garden to fill a very specific need. I have a berm near the back of the yard that is built primarily of the soil that was excavated from my ponds and it is filled with broken brick and gravel. This makes the berm a poster child for ‘very well drained.’ It is also under the shade of a large Ash tree. 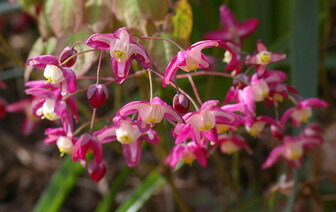 Well drained and shady is a rather unusual condition and one that Epimediums thrive in. When my research told me this, I went looking for this plant, that I previously knew nothing about. I found a couple in specialty nurseries and planted them on the berm. They thrived and are a delicate delight. Well yes they are quite attractive. Flamboyant, no. Most of the species have similar characteristics. Small heart shaped leaves, some with some interesting spring and fall reddish colouration. These leaves grow on delicate wire like stems and most create a mound under 30cm (12") high. The flowers usually appear in the spring and come in a wide range of colours. White, yellow and a variety of red / maroon mixes. 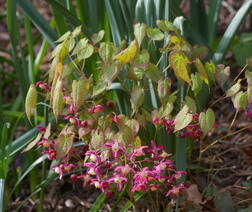 A spray of colouful flowers well above the foliage, is born on delicate stems and lasts for a few weeks. Throughout the summer the foliage remains an attractive groundcover and on my berm continues to look good even when the nearby Hydrangea starts to wilt. Rapid or invasive they are not. They slowly develop into a clump that may reach 45 cm (18") across and most species are under 30 cm (12") tall. I cannot find any sources for seeds but there are several specialty nurseries that carry quite a range of cultivars. They are propagated by root division in the spring. Many of the species will tolerate my dry shade conditions but they apparently will also be happy in moister woodland areas. Most are hardy to U.S.D.A.Zone 4 or Canadian Zone 5. Give them a try. Like me, you will grow them for their tolerance and become captivated by the delicate flowers and foliage.